In this class you will learn to master your BERNINA Sewing Machine. In this class you will continue to learn about your PFAFF machine, decorative stitches and machine quilting functions. Get your creative juices flowing! In this four part class, we will learn many of the embroidery stitches in Sue Spargo's Creative Stitching book and talk about ways of adding texture to your projects. We will discuss the different needles used and the many different types of thread that will add dimension to your projects. Some of the stitches we will learn are the bullion knot, drizzle stitch, palestrina knot, woven picot, trellis stitch, rosette chain, and woven circle. 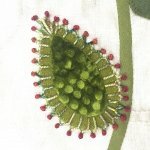 If you are a fan of Sue Spargo's work or just a lover of embroidery and handwork, this is the class for you! If you have a project you would like to work on, you may bring that or just bring a piece of wool to practice stitches on. This is a technique class.